If you’ve never used Reddit before, it’s an internet forum divided into different topics (called subreddits). 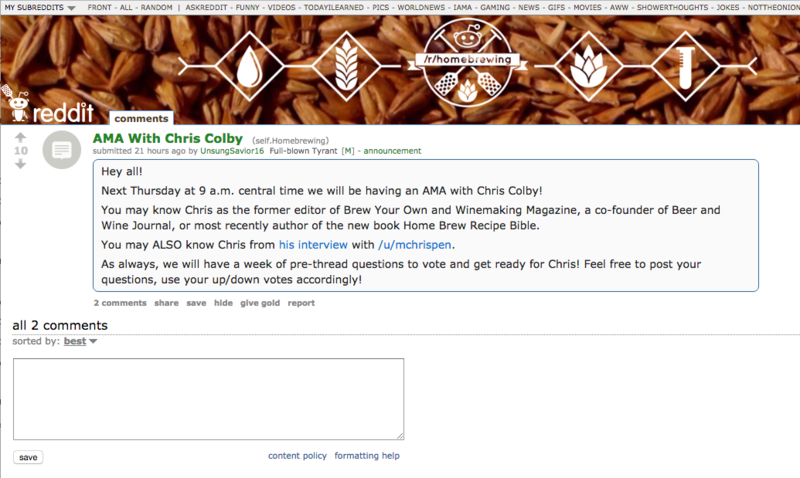 My AMA is taking place in the Homebrewing subreddit (/r/Homebrewing). 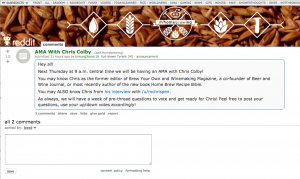 To find that, go to the Reddit homepage (www.reddit.com) and type “Homebrewing” into the search box in the upper right. To actually ask questions, you have to sign up for a Reddit account, which is free. Leading up to the AMA, readers are submitting questions, and other reddit users are voting up or down on these submitted questions. The moderator will then ask questions in the order in which people have shown an interest. So, if you’re interested, look in on my AMA Thursday morning (10 EST/9 CST). And if you’d like, submit a question today or tomorrow. Also, if you happen to be attending the Dixie Cup — the annual conference of Houston’s Foam Rangers homebrew club — come to my talk Saturday morning on foam. In addition, I’m a guest on James Spencer’s podcast (Basic Brewing Radio) this week. We talk about brewing cream ales, both for fun and for submitting to homebrew contests. If you enjoy Beer & Wine Journal, please consider supporting us by clicking on one of the donate buttons. Thanks. Also, my book — “Home Brew Recipe Bible,” by Chris Colby (2016, Page Street Publishing) — came out September 20, 2016 and is available from Amazon and Barnes & Noble. You can also find the nearest independent bookstore that sells it on Indiebound.